Mets catcher Travis d’Arnaud and reliever Jim Henderson conferring in the fourth inning. WASHINGTON — With each pitch, Rafael Montero looked more out of place. Montero, a once-promising prospect who has fallen on hard times, could not find the strike zone. And just as in his past starts, the walks were piling up. But this time, the Mets could not survive them. 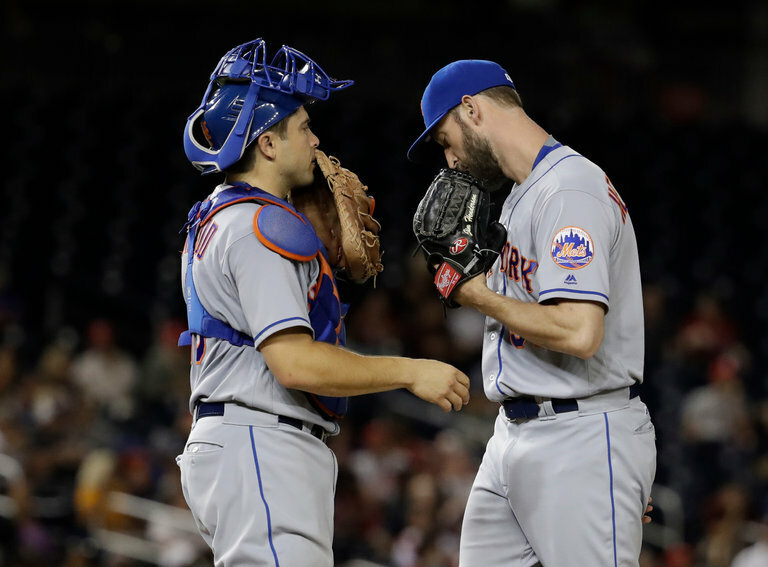 Desperate for wins in a tight National League wild-card race, the Mets fell to the Washington Nationals, 8-1, on Monday night at Nationals Park. Despite high walk totals in Montero’s previous two starts, the Mets had won. Against the Nationals, he lasted only five outs and allowed six runs. Twice in the first inning, he walked batters with the bases loaded. “I tried to do my job, and things didn’t go as I hoped,” Montero said. This three-game series means more for the Mets, who retained their hold on the second N.L. wild-card spot despite the loss, than the Nationals, who possess a lead so large that the East Division race feels all but decided. Is Saturday's Spurs-Cavs an NBA Finals preview?